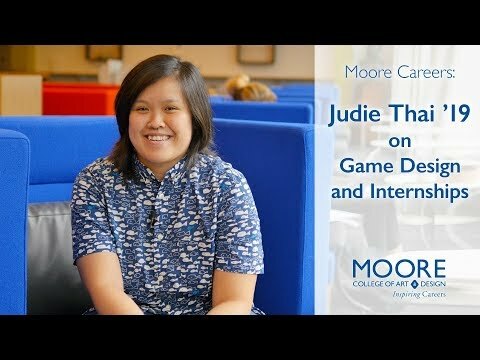 For her junior-year internship this past summer, Judie Thai ’19 put down the game controller and picked up some cards. The Animation & Game Arts senior learned the ins and outs of creating a board game while interning at Cardboard Fortress Games in Philadelphia, a company owned by Nicole and Anthony Amato. The Amatos are game designers who are heavily involved in the tabletop game community, both locally and nationwide. Thai was awarded one of five Penny Fox Internship Fellowships at Moore’s Honors Convocation in April 2018. A generous gift from Penny Fox, chair emerita of Moore’s Board of Trustees, and her husband, Bob, the competitive Fox Internship Fellowships provided $5,000 to each of this year’s awardees. The fellowship money made it possible for Thai to buy a new laptop and game development software that will carry her beyond graduation. Thai met Nicole Amato a couple of years ago when Thai was a student in Amato’s History of Game Art and Animation class at Moore. She contacted the Amatos this year when she decided she wanted to learn more about designing a board game. Nicole Amato said there are big differences between developing a board game and a video game. Thai came up with the game Sky High Cacti, a competitive strategy game in which two to four players try to grow their cacti by obtaining water cubes while other players try to block the growth. Players draw cards to determine their next move. Competitors can call upon animals of the desert to sabotage the others’ plants. A player wins when they’ve grown the biggest cactus. Nicole Amato said the hardest part about mentoring Thai was teaching her how to make rules for the game. Through her relationship with the Amatos, Thai was able to play-test an early version of Sky High Cacti with members of the Philadelphia Game Makers Guild at Redcap’s Corner, a game shop in the Powelton Village section of Philadelphia. Thai divvied up cards and game pieces to several members of the Guild in August. Her mentorship relationship with the Amatos led to taking her game to a bigger stage in September – Keystone Comic Con at the Pennsylvania Convention Center. Thai said the whole process was enlightening and rewarding. “I see her in a really good indie studio doing some amazing things,” said Nicole Amato.